I've been using a bike commuting to and from work since 1986, with the exception of a 2 year period where I worked in downtown Boston and used the train instead. I ride year round, although I do tend to telecommute during really bad snowstorms. Riding my bike to and from work allows me to get a couple of good hours of exercise a day, keeping me in good shape and allowing me to eat everything in sight year round. I typically get about 5,000 miles a year just from commuting. The time spent commuting by bike is often less than half an hour longer than I would spend if using a car, and sometimes, depending on traffic, about the same! I get a lot of thinking and designing done while riding back and forth to work. It is simply amazing how many times I figure out how to solve a bug on the way home. I am also usually able to decompress quite well while riding home, so it is usually a good stress reducer (unless some driver cuts me off close to home). Commuting allows me to test out lights, clothing and equipment I'll be using on brevets. And finally it reduces wear and tear on the car, since I almost never use it. Job selection can be very important in making bike commuting feasible. For me the ability to commute by bike is a high priority, so it's one of the things I consider when looking at a new job. Is it within a good range? Is it accessible? Do they have showers? Do they have a secure place to park the bike? The ideal company for me is about 12 miles from home, is reachable by a lovely quiet route, has showers and lets me park the bike inside (preferably in my large window office). Of course I also look for stable financials, challenging work in my field (Java GUI), and nice people, but the bike commuting aspect is one of my top priorities. Showers in the building are great. A nearby health club works well too. If you can't get either of these, you can actually clean up quite well with wet towelettes or skin astringent. I use a deodorant crystal which works better than any conventional deodorant I've ever tried. I also keep a good supply of toiletries (shampoo, soap, etc. ), as well as comb and hairdryer at work. I also have a couple pairs of shoes, a jacket, and umbrella in the office all the time. I also tend to keep a pair of shorts and long pants there, bringing in fresh ones once a week. I also bring in a fresh towel weekly. I've been lucky with most of my jobs in that the shower facilities have a place to leave a towel to dry. I now have heated towel rail for hanging my clothes. 95% of the time, it is switched off, but if I do get soaked riding in, I plug it in, and my clothes are dry by the evening commute. In the old days big CRT monitors were a great way to dry wet gloves. Flat panels just don't cut it! While other folks have drawers full of files, I usually end up with one drawer with spare clothing and toiletries, etc. For my line of work, I am able to wear casual clothes, but I do occasionally dress up. I have been known to keep a suit in the office, and use nearby dry cleaning facilities. I prefer indoor secure parking, but have used outdoor lockers and even bike racks. I've worked a few places where I brought my bike into my office or cubicle, some with special places or locked rooms, one with bike lockers, and a few where I've had to lock the bike up outside. John and I worked in one building that did not allow bikes inside. For a while they let us use a small room off the loading dock. Eventually one of the companies bought lockers, which were installed in the parking lot. In addition to looking at showers and parking facilities, there is the important issue of the route. Is the place accessible, within a reasonable distance, without having to be on too many busy roads? I've had commutes ranging from 4 to 17 miles. 4 is actually too short for me. It takes longer to get dressed than ride there, but you can stretch the distance and it is nice when the weather is awful. 17 is on the long side, but does help keep me in good shape. We have a good series of bike maps in Massachusetts. And when researching a new job, one of the first things I do is pull out those maps and try to find a good route. 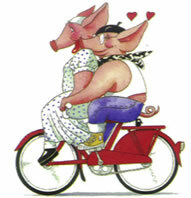 There are a couple of different factors that affect choice of bike. Parking, distance and weather are the primary ones for me. For many years I lived and worked in the suburbs. The commute was long and rural. A major mechanical problem could leave me with a potentially very long, very cold walk, with no easy alternatives. With a secure place to leave the bike, I can use a higher end machine with an emphasis on reliability. My winter commuter is a fixed gear. Eliminating derailleurs (and cassettes or freewheels) reduces maintenance significantly as well as eliminating issues with frozen cables which turn a multi-speed bike into a single speed anyway. If you start out fixed, you at least get to select which gear you want. Single speed also offers simplicity, but a fixed gear takes advantage of momentum and I find it easier for climbing on a fixed gear thanks to the flywheel effect. For a while when I first started riding fixed gear, I was a bit nervous about descents and just getting used to never coasting. I have a flip flop hub and put a single speed freewheel on one side and fixed cog on the other. I tried both, and really found the effect of fixed when climbing was as if I actually had a lower gear. The wheel propels your feet, while your feet propel the wheel, almost pushing you up hills! On descents, I just got used to spinning and use the brakes when I'm uncomfortable. I don't have that freewheel installed anymore. I do have a 16 tooth cog on one side and 17 tooth cog on the other (with a 42 tooth chainwheel) . I can use the lower gear with my studded tire or on hillier routes, and the higher on a flatter route or if I feel frisky. To be honest, I rarely flip the wheel, using the 17 most of the time. The theory also goes that one should have more control on icy roads with a fixed gear. I've been riding fixed for about 10 years now, and am pretty comfortable with it. I was a bit intimidated at first, but it did not take long at all to get used to it. As I said above, it is not the same as a single speed, so experimenting with riding in one gear and not coasting won't give you a feel for what it's like. If you have never tried one, try to find one to borrow, or just dive in and build one up. Sheldon Brown is one of the best resources for info on fixed gear bikes. A bike with long horizontal dropouts will work well. 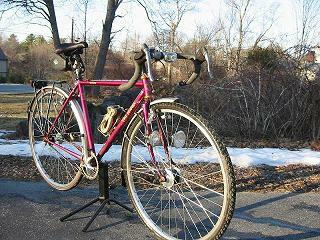 The growing popularity of cyclocross in the US is making it easier to find inexpensive bikes with good clearances. My winter commuter is exactly that - a cross frame with horizontal dropouts. In recently years, fixed and single speed bikes have become hip and trendy and inexpensive. The one caution is many come with track ends - rear facing dropouts, which don't work well with fenders. If you want to use fenders with SS or fixed, try to find a frame with horizontal dropouts or an eccentric bottom bracket or consider a chain tensioner. 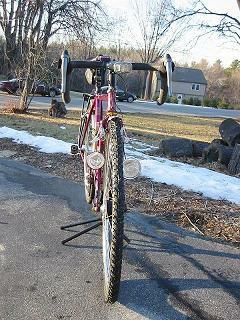 Speaking of fenders and clearance: Fenders are pretty important on a commuting bike around here at least. I ride in all weather, and want to stay relatively dry. While I can tolerate an hour of being wet, trying to get the clothes to dry during the day before heading home at night can be tough, and there is nothing more unpleasant than putting back on wet clothes for a cold ride home. But fenders aren't just good for when it's raining. When they really are noticeable is on that nice sunny day in the spring. Folks are itching to get out and ride. The sun is shining and snow is melting and running across the road. Sand and salt are everywhere, and fenderless riders have a strip up their backsides of mud, sand and salt. But those with fenders are clean and dry! In addition to clearance for fenders I want room for a fatter tire. My commute route always has a few potholes. I am also riding home after dark. Even with the best lights and memorizing where every hole is on the way home, I want the extra protection and comfort of a fatter tire. I don't like fixing flats on the way in or out, and I hate replacing dinged rims even more. Again this is where a cross bike really shines as a commuter, with all that extra fat tire clearance. I also mentioned that I use a studded tire in the winter. That snow melt during the day freezes once the sun goes down, and can make the ride home a bit dodgy. Studded tires can make all the difference in the world getting through black ice upright. I just use one on the front. If you hit ice with the front wheel, it usually turns and you are almost guaranteed of going down. A rear wheel slip is usually just a matter of traction, rather than steering, and it is easier to recover. When conditions are bad enough to warrant two studded tires, I telecommute. For me it really is more for the occasional spot of black ice. John has used both front and rear studded tires. For one job, he took a road that didn't see much snow plow traffic and two were a lot more important for him Nokian and Schwalbe make studded tires in 700C and 26 inch sizes, with different models for road, offroad and deep snow use. Studded tires do add a lot of resistance. On the other hand, they make you a lot stronger and when you go back to regular tires in the spring, you will fly! For additional tips on winter riding (and clothing), see my winter tips article. 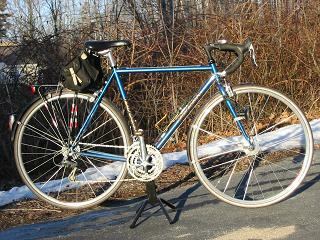 As the weather gets nicer in the spring, I tend to switch over to using my brevet bike for commuting. It has lights, fenders and racks and works well for commuting and long overnight unsupported rides. By using it for commuting, I can also test out new stuff and be sure everything is mounted securely. It is amazing how many of the things I want in a brevet bike, I also want in a commute bike, so rather than repeating that article, just click here. If leaving the bike unattended at a train station, or outside an office in the city I would look for something that doesn't stand out, or invite thieves. 700C bikes with drop bars tend to be less inviting to thieves than mountain bikes. But it often depends how sophisticated the thief is. Since I have not had a commute where I had to do this, I will try to refrain from offering advice for which I have no experience! Lights for commuting and brevets also have a lot in common, and I use the same for both. Check out the article on lights. To carry my gear in and out, I use either a Carradice Saddlebag or an Ortlieb pannier. The pannier is good for situations where I leave the bike in a remote spot, outside, a bike locker, or a closet off a loading dock. I can easily remove the pannier and take all my stuff with me. Ortliebs are waterproof, so they keep my work clothes and anything else I'm carrying in and out (palm pilot, documents, books) dry. The Carradice works well if I don't need to remove the bag (bike parked in my office). Carradice Bags are also waterproof, although you can't submerge them in a river, like an Ortlieb bag. They come in a variety of sizes and many have an expansion flap, which comes in handy for that occasional oversized load. If using a bike without a rear rack, a Carradice works quite well with a Bagman support. Like bikes, there are many different approaches to clothing. Again, because my commute tends to be long, I tend to value warm, dry clothing. The winter tips article has loads of advice on dressing for winter. As I mentioned above, I have a drying rack to hang out my damp clothes during the day. There is nothing worse than putting on clammy damp clothing for a ride home. For that reason, clothing that dries easily and doesn't retain odor is a good idea. Wool works quite well for this. I do use cycling shoes, but go for the walkable variety. But then I use walkable shoes for all my riding. Coworkers will think I am nuts, but some do have an appreciation and admiration. Ice and new and growing potholes are the biggest winter hazard. In the spring, it's sprinklers. I'll be riding along perfectly dry, when suddenly as I am passing a pristine lawn, their automatic sprinkler system, which is invariably set to water the pavement will come on, and soak me! Summer hazards are usually lots of other cyclists out for the pleasant weather. In the fall, danger comes from squirrels and acorns. Squirrels are running around like mad, shaking trees, knocking acorns loose, which bounce off my helmet, while the squirrels try to dash between wheels. Despite all these hazards, I do love riding in and out of work, and highly recommend it.